"Jónsson completely rejected naturalistic depiction and publicly criticized the classical art tradition, which he felt had weighed artists down. He emphasized the need for artists to forge their own path and cultivate their originality and imagination instead of following the footsteps of others. His ideas were related to German symbolism, and he developed a figurative language composed of interpretable symbols, personification and allegory." In 1909, after living abroad for almost 20 years he made an arrangement with the Althing to provide him with a home and studio in Reykjavík. In return, he agreed to donate all his works to the country. Einar designed this combination living and working space in collaboration with Architect Einar Erlendsson, though early plans for the house were designed for him by Iceland's State Architect, Guðjón Samúelsson, but these were never realised. 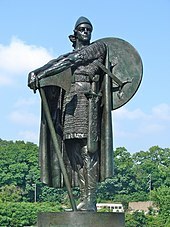 In 1914 Einar was awarded a commission by Joseph Bunford Samuel to create a statue of Icelandic explorer Þorfinnur Karlsefni (Thorfinn Karlsefni) for placement in Philadelphia. Bunford commissioned the sculpture through a bequest that his wife, Ellen Phillips Samuel, made to the Fairmount Park Art Association (now the Association for Public Art), specifying that the funds were to be used to create a series of sculptures “emblematic of the history of America.” Thorfinn Karlsefni (1915–1918) was installed along Philadelphia's Kelly Drive near the Samuel Memorial and unveiled on November 20, 1920. There is another casting of the statue in Reykjavík, Iceland. In 1917, the day after he married Anne Marie Jørgensen, he and his bride travelled to the United States to complete the work, and today Einar's intrepid Norseman stands on East River Drive in Philadelphia. Several years later, in 1921, his second major North American work was erected when the Icelandic community in Manitoba, Canada purchased a casting of his Jón Sigurðsson statue and had it placed in the Manitoba Legislative Building grounds in Winnipeg. As with the version in Reykjavík, this statue included the bas relief The Pioneers on the base. Einar's works fall into three general categories. First, there were the public monuments that he was commissioned by the government to produce. The second group was private commissions that he obtained, consisting of portraits and cemetery monuments. The third collection consisted of the private works that he labored over as he became increasingly and deeply spiritually attuned and reclusive. In this large body of works Einar's spiritual nature is clearly seen, though it is often difficult to describe. The themes for these works are frequently drawn from Christ's consciousness, deep Cosmic spirituality like the eternal, infinite body and consciousness of the universe or God, Icelandic Mythology (Understanding of the so-called Norse mythology or North-East, North-West and even Central-European War-Godhs mythology is just a part of Icelandic Mythology and understanding or description of these is mostly derived from the Icelandic one) and Icelandic folk tales. Einar's world is populated by Elfs, "Hidden people" or "Huldufolk", Vættir, Jötnar, angels and trolls, by beautiful women and bold warriors, and most of all a layer of symbolic content that can invariably be felt, but not always understood. A hint to some deeper meaning in Einar's powerful art is for example: "Karma" an eternal law of energy which returns all action towards its origin. Like in Christ's saying that one will reap what one has sown. That same law or eternal principle, changes the will and desires of the psyche or so to speak. This is because of the fed up condition or state of "mind" or psyche. One will eventually be tired and sick of destruction of nature or other people's lives and the desire for constructive live-giving actions will be dominant. One example of this is the sculpture "Skuld" where Einar uses Icelandic Mythological symbolism of "Urdur, Verdandi and Skuld" which were the witches of destiny or "Karma". There are also very positive hints in other pieces of Einar's masterful art, to that, that every being or lifeform is eternal in its essence and evolves and chances on the outer sides or layers or material sides of its consciousness like the body, thoughts and desire. This outer part or detail of the consciousness is not even understood in physics, phenomenon of time, space and matter that is to say. The connection of the soul or rather its eternal and unchangeable part or layer of the whole consciousness to the world of time, space and matter is even further away from understanding except with symbols, and eventually later on, and only with self experience. All things considered, Jonsson is unique in the world of art. Egypt. But Jonsson's nearest spiritual relative is William Blake. In recent years Einar's plasters have been cast in bronze and placed in the garden of his home and studio or in city parks in Reykjavík and throughout Iceland. He donated his work to the Einar Jónsson Museum in Reykjavík, which opened in 1923. ^ Olafur Kvaran, "Sculptor Einar Jónsson: The Quest for Originality," The Einar Jónsson Museum, 2003. ^ "Full text of "The Icelander Thorfinn Karlsefni who Visited the Western Hemisphere in 1007"". archive.org. Retrieved 2016-05-20. ^ "Thorfinn Karlsefni - Association for Public Art". associationforpublicart.org. Retrieved 2016-05-20. ^ grapevine.is. "Art Archives - The Reykjavik Grapevine". grapevine.is. Retrieved 2016-05-20. Modernist sculpture parks and their ideological contexts – on the basis of the oeuvres by Gustav Vigeland, Bernhard Hoetger and Einar Jónsson, Małgorzata Stępnik, „The Polish Journal of Aesthetics”, No 47 (4/2017), pp. 143–169. Wikimedia Commons has media related to Einar Jónsson. This page was last edited on 22 November 2018, at 05:19 (UTC).